Some individuals have a hard time waking up in the morning, but it is even worse when they are greeted with intense heel pain. This symptom—sharp pain under your heel first thing in the morning—is likely the result of an ailment known as plantar fasciitis. There are treatment options for this common injury, but first you need to be able to identify it correctly. You might not be aware of this, but you have a thick band of fibrous tissue that runs along the bottom of your foot called your plantar fascia. This tissue is responsible for supporting your foot arch and absorbing the force that comes with walking, running, and jumping. When the tissue is overworked, it becomes stretched and sustains tears. This leads to inflammation and pain. A sharp, stabbing pain is the primary symptom of this condition. This is especially evident when it happens in the morning upon waking or whenever you start to move following extended periods of sitting or standing in one place. You may also experience it following exercise. This condition is rather common, but there are factors that can make it more likely. These include foot structure, age, and obesity. Individual who have either high or low arches are more likely to develop problems with the ligament, as are those who fall between 40-60 years of age. Those who are overweight put excess stress up on the plantar fascia when they walk or stand, and this places them at greater risk for this injury. Changes in physical activity or running long distances can also lead to this condition. For this reason, it is important that you ease into activities—increase levels of intensity, duration, and frequency by no more than ten percent per week—and warm up and stretch properly beforehand. Conservative treatment methods are often quite successful for plantar fasciitis and surgery is rarely required. Given the nature of the condition—an overworked band of soft tissue—strengthening and stretching activities can be an essential component of treatment. If you are able to perform the basic strengthening and stretching routines on your own, you may able to do this in the comfort of your own home. If you feel more comfortable having the guidance of a professional, physical therapy might be right for you. In addition to stretches and strengthening, we may prescribe orthotics to help redistribute pressure and body weight more evenly, thereby reducing strain on the plantar fascia. An icing routine—typically two or three 15-minute sessions during the day—and medication can help to alleviate symptoms like pain and inflammation. The medication will often be a nonsteroidal anti-inflammatory drug (NSAID), like naproxen or aspirin. The conservative treatment methods are usually rather successful, but you might need additional measures like steroid shots or surgery. When we recommend steroid shots, they are often done for temporary pain relief and used in moderation. It is important that they be used sparingly because the fascia can weaken or even rupture when multiple injections are used. At Dallas Podiatry Works, we offer a simple treatment called Extracorporeal Pulse Activation Treatment (EPAT) to use pressure waves to accelerate your natural healing processes. Surgery is rarely required, but there are a distinct minority of cases where the severe pain is not responding to conservative options. In such an instance, we will discuss this so you completely understand your options and know what to expect. 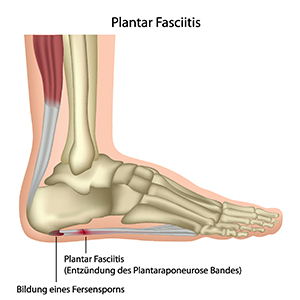 When you experience sharp, stabbing pain first thing in the morning, come in to see if plantar fasciitis is the culprit. Make an appointment today with Dallas Podiatry Works and let us provide the expert care you need. You can call us toll-free at 972.566.7474 or use our online form to request an appointment at either our Plano or Dallas, TX offices.